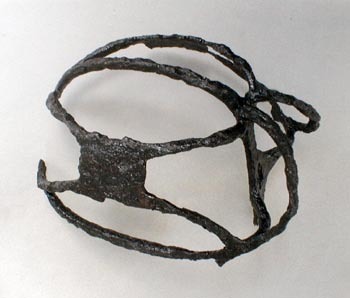 Basket Hilt: Originating in Europe and well known by the mid-16th century, identified strongly with Scotland but also adapted by the English, the basket hilt is well represented in 17th-century Virginia archaeological collections. This example is very similar to the type of hilt that would have been mounted on an English broadsword during the period 1610-1640. It is open in design and employs bars that are thick and strong. Loops, or “arms of the hilt,” have been included at the base to provide protection for the thumb and forefinger. It was recovered from Jordan’s Journey in Prince George County near Hopewell, Virginia.